At the foot of a rolling hillside on the coast of Maine, beneath the meadow of tall grass and lupine, lies a patch of bleached white and broken clam shells. The chalky remnants protruding from the dark soil are the only visible sign of an ancient shell midden — an important archaeological site that can tell a thousands-of-years-long tale about coastal inhabitants and environments. Just a few meters away, some timeworn shells spill from an eroding beachside embankment and fall into the tide. With each passing year, more and more of this site is lost to the sea. This trend is likely to continue — even accelerate — in the face of increased storm intensity and sea level rise due to changing global climate. Maine’s coastline is dotted with more than 2,000 archaeologically documented shell middens and virtually all of them are eroding into the ocean. Some quite rapidly, which is putting valuable records of cultural and environmental history at risk, says Alice Kelley, a geoarchaeologist at the University of Maine. Kelley, an assistant research professor in the Climate Change Institute, is working with a team of archaeologists and geologists from UMaine and the Maine Historic Preservation Commision to survey these fragile archaeological sites using ground penetrating radar (GPR). The goal of the Maine Sea Grant-funded project is to better understand the current state of Maine’s many shell midden sites — to document what is there and has the potential to be lost, and the rates at which erosion is happening. It is the first concerted use of GPR technology on the Maine coast to rapidly assess the state’s middens, many of which, due to time and budget constraints, have not been visited by archaeologists since the 1970s or ’80s. The information will help land and cultural resource managers triage the most at-risk sites for preservation or conservation. Or, at worst, emergency archaeological excavation. Shell middens in Maine are ancient heaps made up largely of discarded clam or oyster shells. 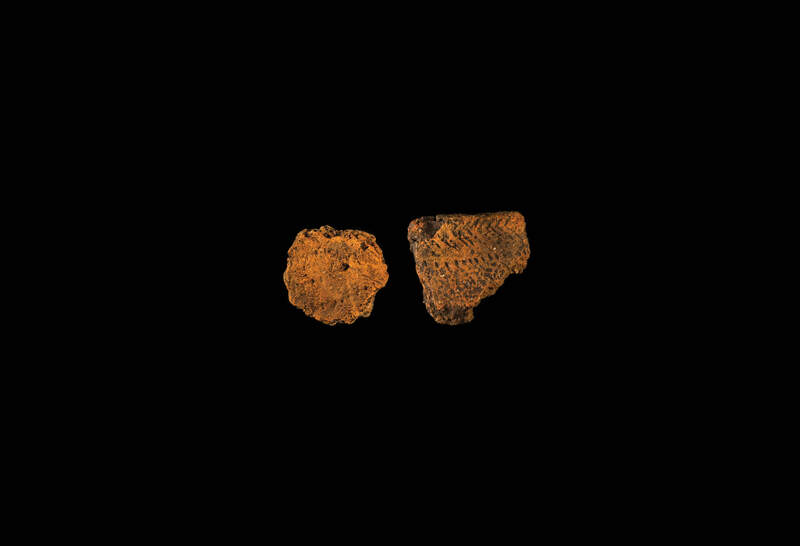 They also contain many other cultural artifacts associated with daily life, such as pottery, stone and bone tools, and even other types of organic remains, says Kelley. For thousands of years, the ancestors of the Wabanaki people called the Maine coastline home. Native families lived, fished and hunted in these coastal environments. 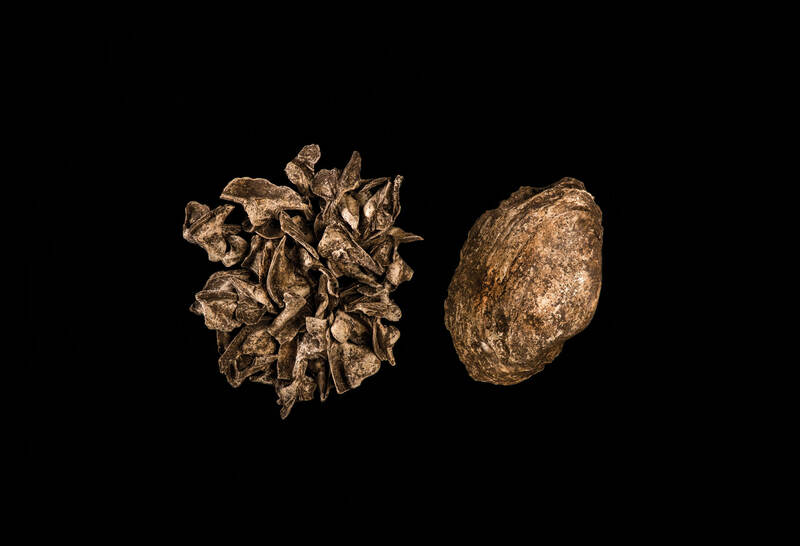 Not only in the summer, but also in winter months when other food resources became unavailable, people turned to the surrounding mudflats and harvested the abundant bivalves. 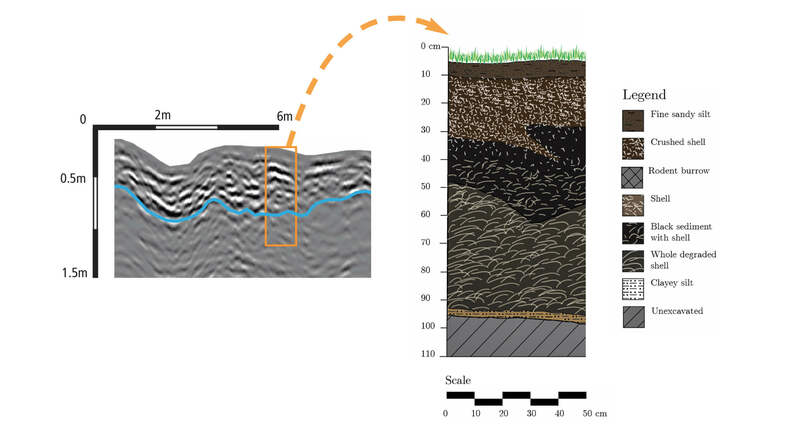 Ground penetrating radar (GPR) uses short radar pulses to discover and identify features beneath the ground surface. People continued to return to and occupy the sites. Perhaps for just for a few years. Perhaps for centuries. Sometimes they settled on top of the shell deposits and season by season, the discarded shells and cultural refuse accumulated, slowly becoming incorporated into the geological stratigraphy of the landscape. While the sites are often rife with cultural objects that paint a picture of the lifeways of coastal residents in the landscape that became Maine, they also are unique in their abundance of environmental and ecological information. “The faunal remains. 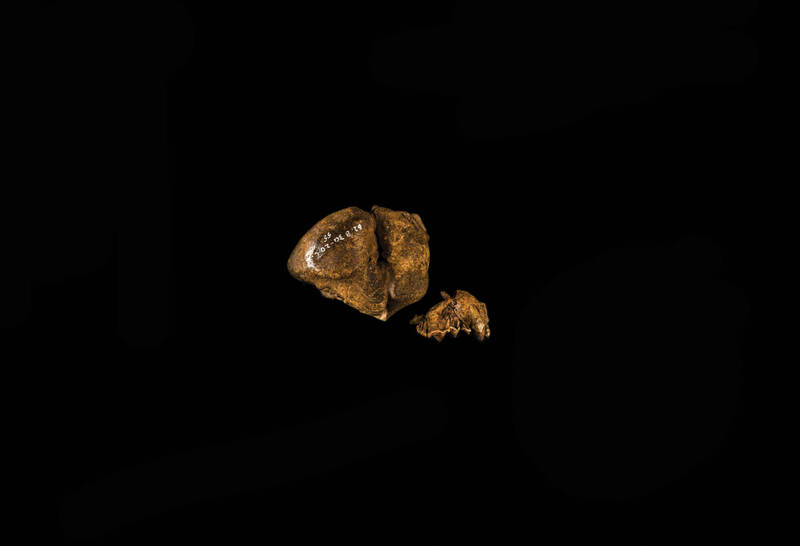 The fish bones, the bird bones, the mammal bones, the fish ear bones, all of those sorts of things tell us what was in the Gulf of Maine at that time,” long before the pressures of industrialized fishing, says Kelley. 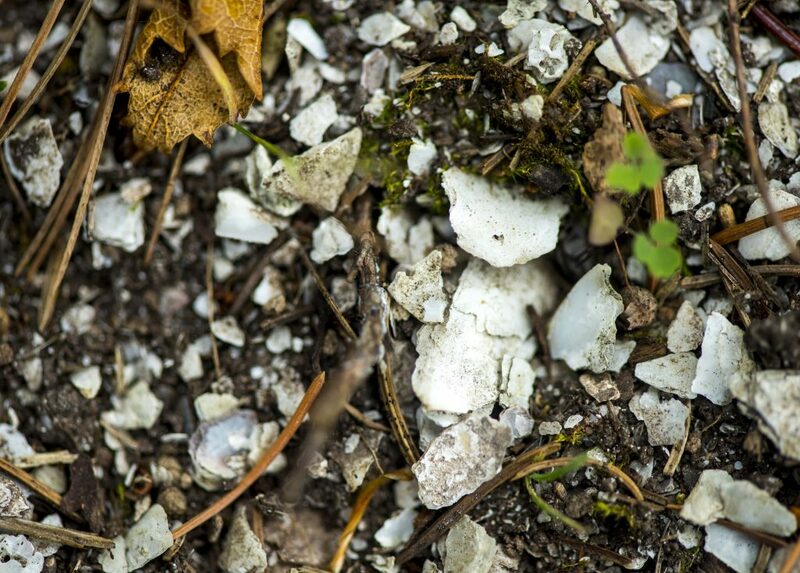 The calcium carbonate from the layers of densely packed shells effectively buffers against Maine’s acidic soil and creates ideal conditions for organic preservation. As a result, organic materials, such as animals, and the archaeologically rare tools made from them, can be found, whereas at other sites they are quickly lost to decay. 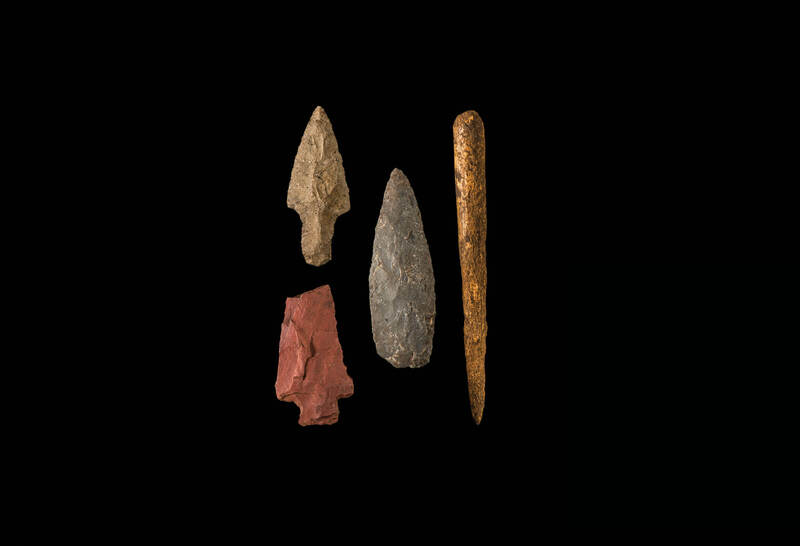 “The (middens) allow us to examine the local environment through the animals Native people were using,” says Arthur Spiess, the senior archaeologist with the Maine Historic Preservation Commission and co-investigator on the project. The bones of land and sea mammals, including moose, deer, bear, beaver, seals and porpoise can be found alongside copious fish and bird bones, all intermixed and preserved amid the shells. They are the only places where the remains of some now-extinct native species, such as the sea mink and the great auk, can be found. 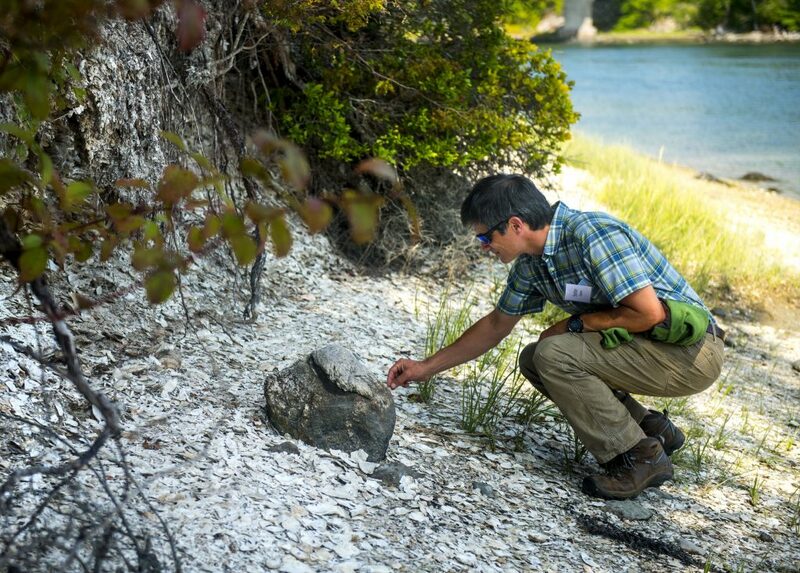 Archaeologist Stefan Claesson inspects ancient oyster shells eroding from the Glidden Midden in Damarascotta, Maine, one of the largest shell middens on the U.S. East Coast. However, for the majority of the state's more than 2,000 shell midden sites, small scatterings of broken shells are all that remain. Spiess, who has investigated dozens of Maine’s shell middens throughout his 40-year career, says the ancient environmental records interred in the middens can inform current fish and wildlife experts with a perspective spanning the past 5,000 years. Official Inland Fisheries and Wildlife and Marine Resources records have been kept for 50 to 100 years. “Just at the time we’re coming to appreciate what these middens can offer us, sea level rise is accelerating and endangering the middens,” says Kelley. The team members use GPR to survey each of the sites they visit. The technology allows the researchers to identify hidden underground features without having to dig. Traditional archeological excavation is expensive in terms of cost, time and labor. As a result, few shell midden sites are excavated each year — and often only a few square meters of each site can be investigated. The two-day Lost to the Sea Conference, hosted by the Darling Marine Center in August, included a field trip to the Whaleback Shell Midden State Historic Park in Damariscotta, Maine. 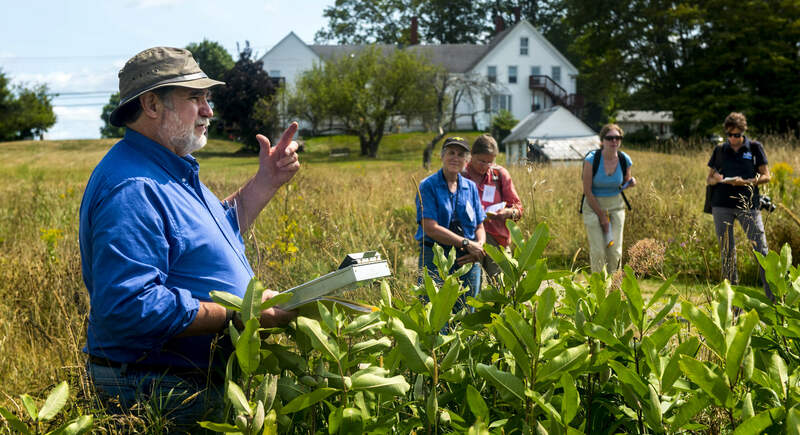 Project collaborator Arthur Spiess, foreground, senior archaeologist with the Maine Historic Preservation Commission, shared the archaeological and historic significance of the site with participants. 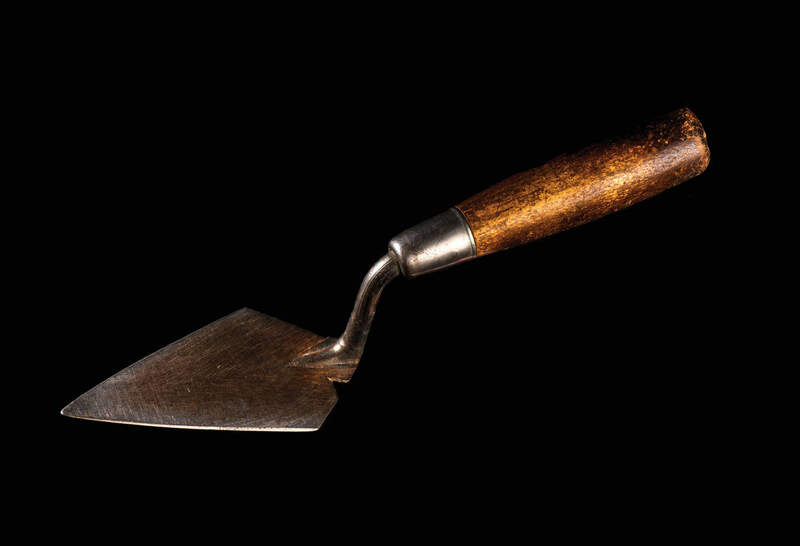 Furthermore, archaeological excavation is an inherently destructive process because it removes artifacts and other material from its original context. “We want to put our emphasis where we can recover the most data without disturbing or destroying (the site) too much,” says Joseph Kelley, co-investigator on the project. Joseph Kelley, a marine geologist and specialist in coastal erosion and remote-sensing technology, is working with Alice Kelley in the field to document the sites. The two, who are married, have collaborated on similar interdisciplinary field research using GPR worldwide, including in northern Peru and the Shetland Islands. With GPR, hundreds of square meters can be surveyed by the team, noninvasively and nondestructively, in as little as a day. And if excavation is necessary, the GPR data can greatly inform where archaeologists should focus their efforts. GPR uses short electromagnetic pulses transmitted from a radio frequency antenna into the ground. The signals are reflected by different underground features — types of soil or sediment, disturbances, voids, rocks and other materials — back to a receiver on the surface. Changes in the underground layers result in different electrical properties of the returned signal. The time it takes for the signal to return to the receiver is used to determine a feature’s depth below the surface of the ground. As the antenna and receiver trace along the surface, a profile of the underlying stratigraphy is generated. To date, the team has used GPR to survey more than five sites along Maine’s coast — from the southern shores to Down East. 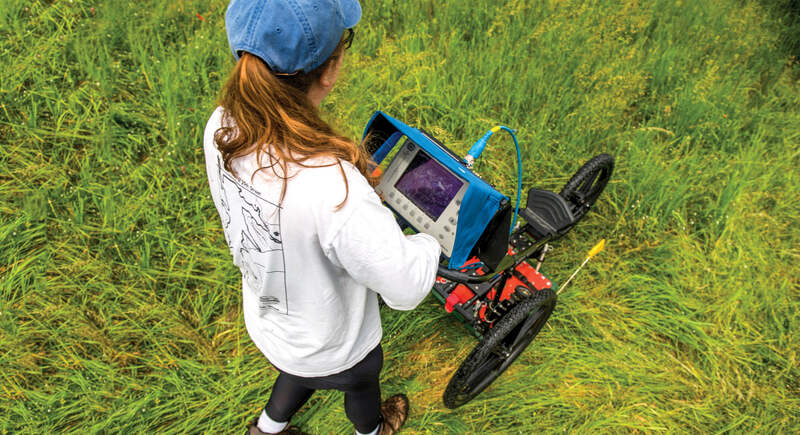 “We can use the GPR to essentially survey what we think is the entire site,” says Jacque Miller, a graduate research assistant in the UMaine School of Earth and Climate Sciences. Miller notes that some of the surveyed sites are much more expansive than previously thought. The project combines coastal geology with archaeology, and draws attention to sea level rise and climate change, and how they are impacting Maine’s cultural heritage, says Miller, who was recently awarded the Richard Hay Award from the Archaeological Geology Division of the Geological Society of America. The GPR data they are collecting will be the core of Miller’s master’s thesis. 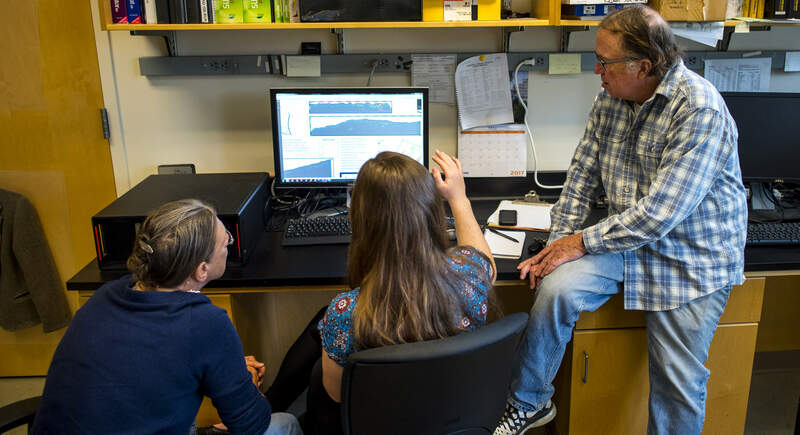 Alice Kelley, Jacque Miller and Joseph Kelley (left to right) interpret GPR reflection profiles on a computer in the lab. Before the GPR data can be evaluated archaeologically, the raw data must be digitally processed and placed in a spatial context. According to Jospeh Kelly, for each hour the team spends in the field, many more are spent back in the lab. According to Spiess, who maintains the state’s official archaeological records, research of this type and scope has never been done on the coast of Maine. While the project represents the first formal collaboration between the Kelleys and Spiess as co-directors, they have worked together for decades. During this time, Spiess says, the Kelleys have made major contributions in Maine archaeology. However, some of the sites have already been erased by the tide. They also are a common target for possibly well-intentioned, but highly destructive artifact collectors, which is why many archaeologists and land managers must be so tight-lipped about each site’s location. “Educating the public is a multifaceted and complicated challenge,” says Spiess, who’s been doing public outreach in archaeology in the state throughout his career. He hopes that key people and organizations, including municipal planning commissions and land trusts, will get involved. With the right players in the game, he says, there is a chance that some of the sites can be protected. The researchers hope to build a network of citizen scientists who understand the importance of the sites and the ethics involved in protecting them — a group that could monitor the sites and report increased erosion or disturbances. To facilitate this, the researchers organized a two-day conference for stakeholders who own or manage coastal properties to intersect with archaeologists, learn about the sites and their importance, and discuss potential conservation strategies. Among the attendees was Joan Ray, the land protection and stewardship director for the Medomak Valley Land Trust. The trust manages over 4,000 acres of land in and around the Medomak River and Muscongus Bay. To the best of her knowledge, there are several dozen shell midden sites in her management area. “We knew the middens existed, but we didn’t pay any attention to them. Not many land trusts in the state recognize these features,” she says. Ray attended the conference knowing little about Maine’s shell middens. But after learning of their significance and their rapid rate of erosion, she now sees their protection as a major concern for the land trust. “We have ways of prioritizing land for preservation, and one of the ways we do that is through its historical significance,” says Ray. While much of the attention is on an area’s colonial history, she hopes that with increased recognition, more of the state’s prehistoric sites can be brought into the fold. “Not just as something that you’d look at and walk by, but that there is something really important here. To have people appreciate what they are and perhaps take some interest in monitoring or preserving them. Alice and Joseph Kelley are no strangers to interdisciplinary collaboration. Alice is a geoarchaeologist, Joseph is a marine geologist. 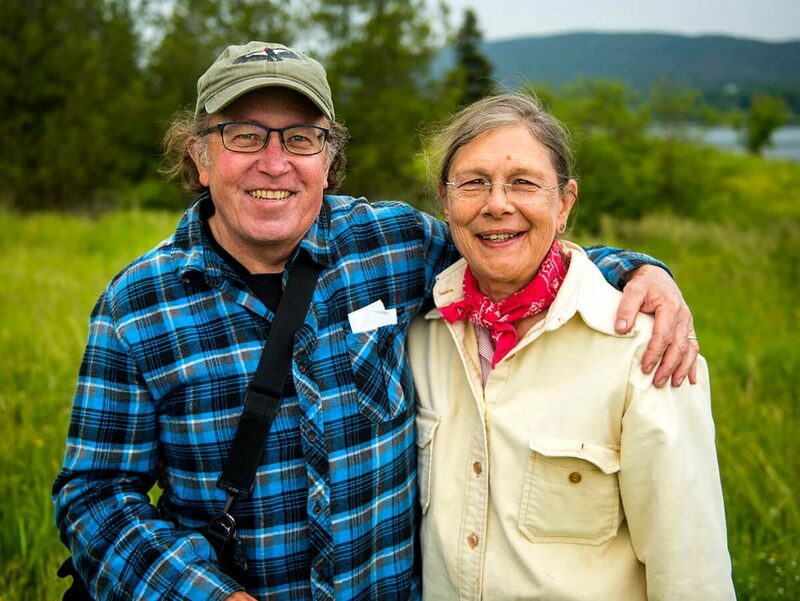 With their varied areas of expertise, the wife-and-husband team make use of a number of geological and geophysical concepts and tools, and apply them to answer archaeological questions. Together, they have collaborated on archaeological and geological research projects worldwide. On the north coast of Peru, the two used GPR to identify architectural elements more than 5,000 years old, buried within a large sandy mound at the site of Los Morteros. They also have used GPR in Scotland’s Shetland Islands to locate the ruins of a small coastal community that was abandoned and buried by encroaching sand dunes during the Middle Ages. Back in Maine, the two have used a variety of oceanographic methods, including side scan sonar and seismic reflection profiling, to explore underwater areas in the Gulf of Maine that were once dry landscapes where people likely lived when sea levels were much lower at the end of the last ice age.